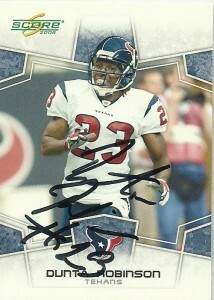 Acquired: TTM, Texans Blitz 2009. Dunta Robinson was the Houston Texans third first round choice in the history of the franchise, taken in 2004 by then general manager Charlie Casserly with the 10th overall pick. He’d be penciled in almost immediately as a starter at RCB for the young franchise across from Aaron Glenn. Dunta had an impact season with 87 tackles and 5 interceptions, which looking back in retrospect counted as his career high. In 2005, the team started purging veterans, and Robinson would become the leader in the secondary. He’d still manage to defend 10 passes and make an interception; However, the team slumped to a 2-14 record. The next season the team drafted his college teammate Fred Bennett to work opposite Dunta, but Robinson suffered a serious knee injury in week 9 of 2007, that sidelined him for the rest of the season, and for the first 6 games of 2008. Although his recovery from the injury was impressive and heartwarming, Dunta did lose a step. He’d also make 2 interceptions in the 2008 season passing Aaron Glenn for the team career leader with 13. The offseason proved to be acrimonious for Robinson as he held out for a big multi-season contract with the Texans. 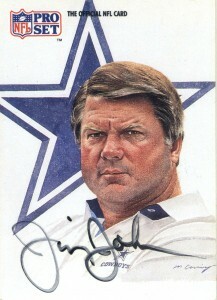 General manager Rick Smith saw otherwise and stuck him with the Franchise Tag- the first designated on a Texan player. Dunta spitefully did not show up to camp until one week before the season started, signing his tender for a one year deal worth 9.957 million dollars. To add salt to the wound, Dunta wrote “PAY ME RICK” on his cleats before the opening game of the season against the Jets. The Texans were favored to beat the Jets at home but laid an egg instead. Robinson had a poor game. It was a perfect storm. The ensuing media brouhaha over his message enraged fans and annoyed management, turning him from a team hero to villain. The Texans responded after the Jets loss, but just missed the playoffs with a 9-7 record. To make matters even worse Dunta did not make a single interception despite starting the full slate of games. 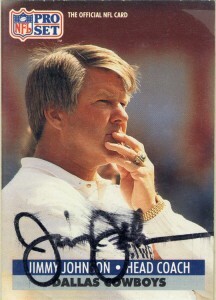 While Robinson expressed his desire and excitement to remain with the Texans, citing the teams’ first winning record as the reason, the Texans did not retain his services. Dunta became a free agent in early 2010 and within days, inked a 6 year contract with his hometown Atlanta Falcons, with 22.5 million dollars in guarantees. Robinson was never the same after his ACL injury, plus once he assumed the #1 defensive back role in the secondary he never made more than 2 interceptions in a season, or became the game breaker that former DB Aaron Glenn was, making many bad arm tackles along the way. In 2009, there also didn’t seem to be that same fire that was there the previous seasons, and you could almost tell he would get easily frustrated and lose his composure. Indeed, Robinson in 2009 was one of the most targeted defenders in the league allowing 64.7% of passes thrown his direction to be completed and didn’t make a single interception or finish in double digits in pass defensed. Regardless, best of luck to a cornerback who was once the heralded son of Houston and now sadly leaves as the black sheep. Listed below are his final statistics for the Texans. David Archer was signed as a free agent by the Atlanta Falcons in 1984, where he’d be the back up quarterback and starter in 1985 and 1986 until Chris Miller arrived in 1987. 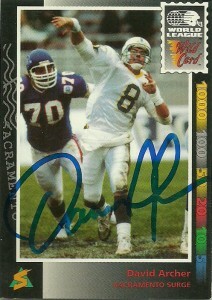 He’d then bounce around the NFL as the backup quarterback for the Redskins in 1988 and Chargers in 1989. He’d be cut and out of football in 1990, but was be picked up by the Eagles in 1991. 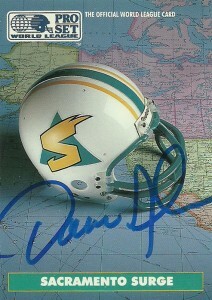 It was at this point that the WLAF intervened and David Archer would have his moment in the sun when he went to play for the Sacramento Surge franchise in 1992. 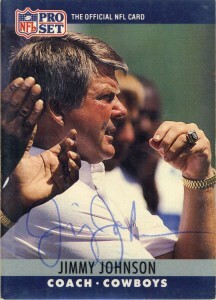 The Surge needed a veteran presence and a makeover to turn the franchise around from its dismal 3-7 showing of 1991 and Archer fit that bill to the T. Archer virtually went on to rewrite all the Surge records, and lead the team to World Bowl II, earning MVP honors passing 22 of 36 and 286 yards with 2 TDs as the team rallied to score 15 points in the fourth quarter. David also grabbed the single season passer rating record at 107 with a whopping 9.35 yards per completion and 29 touchdowns. Archer and the Surge were the Riders‘ nemesis in 1992, and when these two teams met it was usually a torrid match. He would lead the team in a comeback victory over the Riders in the final WLAF game at Bobcat stadium in 1992 after being snubbed in Sacramento in OT by the Riders earlier in the season. After the folding of the WLAF, Archer played with the Eagles an additional season in 1992, and then jumped ship to the CFL USA with the Sacramento Gold Miners in 1993 and 1994, and then the Texans in 1995. He’d then play a single season for the Ottawa Rough Riders, before that franchise was disbursed in 1996. (Quite possibly there is some sort of morose record there for the most number of franchises played for that folded, as Archer had the ‘touch of death’ for 4 franchises over a 5 year period.) He’d take a season off in 1997 uninterested in playing for Saskatchewan, and then play one final season in 1998 for the Edmonton Eskimos. 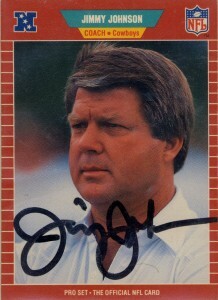 Archer has since gone on to become a color commentator for the Falcons, SEC football and currently ACC football. 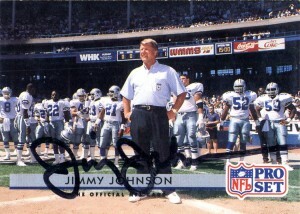 I thought at some point I had gotten his autograph but I was completely mistaken. He signed these two cards in about a month.